Des Moines City Hall is located at 400 Robert D Ray Drive, Des Moines IA 50309; phone: 518-283-4209. Photo: Herndon Hall (Bergmann Mansion), ca. 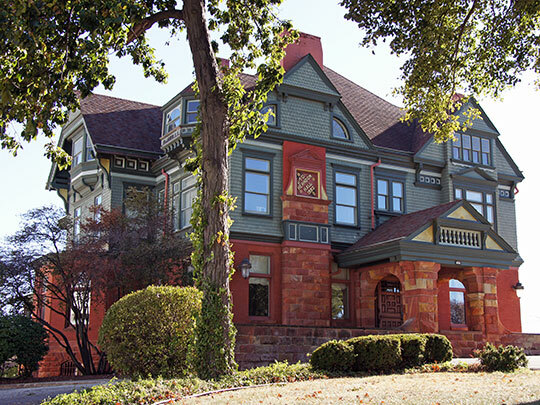 1881, 2000 Grand Avenue, Des Moines, IA. Built by attorney Jefferson Polk who named the house after his wife, Julia Herndon. Listed on the National Register of Historic Places in 2000. Photographed by user:C. A. Tucker (own work), 2012, [cc-by-3.0 (creativecommons.org/licenses/by/3.0)], via Wikimedia Commons, accessed December, 2013. The name Des Moines is probably traceable to the mound builders who long ago lived near the banks of the rivers. The Indians called the main stream Moingona (River of the Mounds). French voyagers, who followed Marquette and Joliet into the Midwest, called it La Riviere des Moines, from the monks who once dwelt in huts beside the water. It was spelled phonetically De Moin, De Moyen, Demoine, and Des Moines. The term, De Moyen, translated as "middle," was understood to refer to the principal river between the Mississippi and the Missouri. Another variation in the meaning is "the less" or "the smaller," referring to a small tribe of Indians living on the river. The Raccoon Fork of the Des Moines River received official mention in December 1834, when John Dougherty, Indian agent at Fort Leavenworth, wrote the War Department recommending a chain of military posts to protect the Indians as "untutored children." The territory was explored in the summer of 1835, when Col. Stephen W. Kearny with 150 men and officers, among them Lieutenant Albert M. Lea, studied the advantages of the site as a possible garrison. In July 1841 John C. Fremont was ordered west by the War Department to survey the Des Moines River, from the Raccoon Forks to its mouth, in order to complete Jean Nicholas Vicollel's map of the territory. He determined the astronomical position of Raccoon Forks, estimated the fall of the river, studied the flora of the valley, and returned to Washington in October. The proposed military garrison was established in May 1843, when Captain James Allen and his company of First Dragoons arrived by the steamer lone from Fort Sanford with another company from Fort Crawford. Captain Allen proposed to name the site Fort Raccoon, but this was vetoed by the War Department as being "shocking; at least in very bad taste" and Captain Allen was directed to use the name Fort Des Moines until further notice. Wilson Alexander Scott, familiarly known as "Aleck," had preceded Captain Allen and his men by some months. When the fort was established, he obtained a permit to settle nearby and raise corn and hay for the garrison. At midnight October 1, 1845, after the Sac and Fox had relinquished their rights, the territory was thrown open to white settlers. When the cannon at the fort boomed out the zero hour, settlers rushed in to take the land, setting fire to the deserted Indian wigwams and staking out their claims. Captain Allen and his men occupied the fort until March 10, 1846, and in the same month "Aleck" Scott purchased 500 acres of land on the east side of the Des Moines River. During the next year he operated the first ferry, and later built the first bridge across the river at this point. Fort Des Moines, after some dissension among rival settlements, was chosen to be the seat of Polk County. The first newspaper, The Star, appeared in the summer of 1849 under the editorship of Barlow Granger. The fort, situated on one of the main immigrant trails to California, was the stopping place of hundreds of gold seekers. Their contagious enthusiasm led many of the settlers to forsake their newly-acquired prairie homesteads and seek fortunes on the coast; but The Star of May 1, 1851, notes another side to the picture: "Most of those who come from the east this year, remain here, satisfied that they can find no better country by going farther west." The word Fort was dropped with the adoption of a city charter in 1857. The city officially assumed its role as State capital in January 1858, after 10 yoke of oxen had hauled into town two bobsleds of archives from Iowa City. During the growth and development of the city, through the 1850s, the Des Moines River was a consequential, if precarious, water way. One day in April 1859 five steamboats dropped anchor and loaded or discharged cargoes at the landing but, after the railroads entered, river traffic declined.